Does people speaking a language that’s not important to you make you “Weep for Humanity”? Occasionally the rational version of Unionist discourse about “pooling and sharing” “economic benefits” the “UK single market” (etc etc) gives way to a more visceral display. After we published last week two pieces about language issues the Swiftian “English Roadsigns: a Waste of Public Money?” by Griogair Labhruidh and our own Tammas Clark reporting on how the Microsoft subsidiary SwiftKey, along with Dr Rhona Alcorn an her group at Scottish Language Dictionaries had been using Bella Caledonia articles and other Scots work to create a programme to recognise, autocorrect and autopredict in Scots, all hell broke out. “Dr Rhona Alcorn of Scottish Language Dictionaries commented: “We are really excited — for the first time we can write texts and not have them turned into a kind of mangled English. Alcorn and her team in Edinburgh collected examples of current and historical Scots texts for the SwiftKey team after being contacted by the developers. This includes material from The National, Bella Caledonia, Robert Burns and even Facebook, as well as content from the new edition of the Concise Scots Dictionary, published this month. Two stories – one mildly provocative and one a tech-story with a neat cultural angle. Whats the big deal? Aside from the comments – which we’ll come to in a minute – it has caused apoplexy amongst the Unions leading proponent, Kevin Hague, who has created an entire platform of the Good and the Great to lend respectability to his more feral friends. 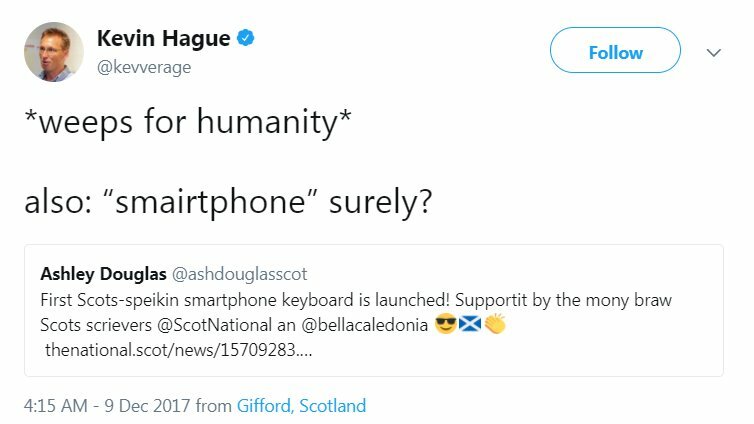 For Kevin – the doyen of rational reasonable Unionism – the idea that someone should be pleased there’s a smartphone with a Scots keyboard isn’t just something to ignore, it’s something that makes him “weep for humanity”. His forum is resplendent with claims about how a progressive and open Britain has been a force for cultural diversity and democracy (as if that’s somehow globally unique). These Islands makes great play about research and Hague himself is always remind people how he is a businessman. But when push comes to shove when a tech company collaborates with a cultural research group to provide a service for which theres a clear demand its a calamity, it’s something to weep for. Of the many internal contradictions of this bizarre project, one of the clearest is the trouble they have with reconciling their commitment to multiculturalism (a good thing) with internal diversity and cultural respect within ‘These Islands’ (a terrible indeed cataclysmic thing). These Islands – ‘Uniting not Dividing’ (unless of course its a prescribed language in which case a wee bit of dividing might be needed). But a clue to why this should be so terrible comes from one of our own commenters. One brave commentator calling themselves ‘Moscow’ wrote: “Not a stand alone language Scots is basically misspelt English spoken in a local accent with a handful of dia lect words that are different depending on which part of Scotland you happen to be in. Promoting Scots as you perceive it is Exclusivist ,prejudiced, anger fuelled claptrap and Scots should be left alone to the real Scottish folk to use as they wish and not commandered by hateful and politically inspired nationalists. Scots belongs to the people not self appointed spokespersons such as yersel’. Apart from the bad English what’s interesting about the comments is the bile is drawn by the idea of “hateful and politically inspired nationalists”. I’m not sure if the people at Swiftkey or the academics behind the project meets the criteria, but what’s clear is that just to express an identity is to threaten the Union and its magical uniqueness to the core. The emerging reality is that the British Union is now so fragile that the very idea of people expressing themselves is a threat. A great multicultural font of diversity must be enforced through a singular uniform unchanging language and culture, innit. Griogair Labhruidh’s piece provoked worse. While weird and wonderful this might be partly true. The astonishing frenzied reaction from conservative Scotland to the idea of cultural development or aspiration is palpable. The Scottish cringe is so deeply embedded – particularly in the over 60s that anything that denotes a shift in this area feels like a threat. If you already believe that the SNP are ‘fascists’ then it’s clearly a hop skip and a jump to think that language is the trojan horse by which some terrible un-named thing will happen. Many of these people will happily attend a twee golf-club Burns night or profess a ‘love of the highlands’ but still manage to retain a deep-seated hatred of their own culture. This may be because they have been so anglicised over such a prolonged period of time, or it be that they simply associate ‘Britain’ with greatness and ‘Scotland’ with failure. That is after all what we have taught ourselves and been taught. The idea of people “making life so unpleasant and difficult for those of us who do not have a problem at all” chimes with the 2014 message from the No voters who were just made uncomfortable by the whole exercise. “I’m fine” – “Please go away” is the message. The idea of a way of life disintegrating, a set of conditions in which social, economic and cultural supremacy was unchallenged is clearly at stake for many people. But the idea that “We all speak English” as a defence through uncomprehending privilege won’t really hold over time. It’s enough to make you weep for humanity isn’t it? Being in the 60+ category, I am beginning to worry that generalisations (often ill-founded) are now taken as truth. No different than ‘false news’. I was blessed with parents and teachers who ensured I knew I was ‘as good as anybody else’ and at the same time as reminding me everyone else was also that. While these inputs on Gaelic and Scots are of interest, I see them as increasingly a diversion from political progress in Scotland. The Westminster folk will be delighted we’re spending our time quibbling with each other about language, heritage and culture. Deid richt Mike. Fact is, maist aye voters spik Scots; mony (maist?) naw voters dinnae. Fiona is awfu docksie wi thon Scots Language Act! Unionist hysteria over the Scots language is a relatively new phenomenon and, I think, a symptom of the erosion of Unionist hegemony and confidence. Sir Walter Scott and John Buchan, who were both staunch Unionists, had an excellent command of Scots, championed poetry in Scots, and deployed the language expertly in dialogue. A continuing problem, of course, is the neglect of the Scots language in our educational system. The Scottish Government needs to do something about that. While the recent efforts on behalf of Scots by Bella Caledonia and The National have been valiant, there is, of course, a very substantial body of modern material in Scots beyond the articles they have published. For example, Lallans magazine has been publishing in Scots since the early 1970s. Yeah that’s definitely my analysis Graeme, as the economic and political arguments collapse the tendency is to revert to the cultural terrain. The problem tactically is that a large groups of soft Nos wont care and won’t share the sort of deep-seated visceral self-hatred that this reflects. So a lot of it is froth from the fringe. I remember an example on these pages when someone wrote in near hysteria about how his child was being taught in Scots at school “brainwashed” etc etc – intrigued about this new immersive Scots language innovation we inquired. It was of course some pathetic one-off Burns Day tokenism. This is why in the main we don’t want either our Scots or Gaelic content to be about this debate – just culturally confident content for and by people using their own languages. I hesitate to contribute to this thread, but I had a slight problem with this remark, “Unionist hysteria over the Scots language is a relatively new phenomenon”, because I do not think it is true. Of course it depends what you mean by “hysteria”. The ‘Lowland’ Scots (I am one, although – I suspect like many people – I include Highlanders among my ancestors), the established order, were much more systematic in the 18th, and the 19th centuries to ensure conformity of language throughout Scotland, than since. I shall not rehearse the history here, but for those interested I suggest they explore the activities of the Scottish Society for the Propogation of Christian Knowledge (SSPCK), which was active principally in the Highlands and combined the purposes of both education and Presbyterianism; focused in consequence of its aims, on “extirpating” the Gaelic language from Scotland, and “learn the people the English tongue”. The SSPCK was founded in 1708, but it was most active from around the 1720s to around 1760. It was quite effective. John, I don’t think we pay nearly enough attention to language, yet to me it seems to be the rather obvious deciding cultural factor in any indyref. Virtually all Yes voters I listened up to 2014 to had fairly broad or very broad Scottish accents. A large number of No voters I listened to had more Anglicised-Scots accents, public school types, and virtually every English accent was a No vote. At the political level there was the same outcome. Even looking at Holyrood today, the broader Scottish accents are predominantly Yes (SNP/Green), whilst the unionist No parties all have significant numbers of Anglicised-Scots and/or English speakers (50%+). The unionists/establishment are well aware of the power of language (hence the suppression of Scots language) but I am not so sure the SNP have twigged to this yet. If they had they would have passed a Scots Language Act long before now and put in place 1,000+ teachers of Scots, oor mither tung efter aw. It makes me think of two things. First, it’s useful to remember that Anglo-British nationalism is one of the major forces driving unionism. And Anglo-British nationalism has *always* been a linguistic project. Where Scotland has forever been a multilingual country, which has had three languages of court since the 8th century, and whose nation-building was done through institutions, Englishness – and then Anglo-Britishness – have always been defined around the English language. This is why England can’t acknowledge its rich tradition of numerous native languages (there are around 30,000 speakers of Anglo-Romany in England to this day) for example. And, secondly, I am reminded that my great-uncle Bardy, who was the Duke of Athol, was brought up speaking Gaelic as his first language – as an aristocrat, in the 1920s, in Highland Perthshire: exactly the sort of place that unionists would smear that it was never spoken. The crushing of Gaelic is much more recent than we ever admit. And just as the British establishment can’t think about Ireland in Brexit negotiations because any brief assessment of its history challenges their narrative about the British empire, so too they hate thinking about Gaelic, because it’s a harsh reminder that Anglo-British nationalism is not and has not historically been a force for good in the world. Adam Ramsey, I think you have made a good point with regard to Anglo-Britishness expressed through its mandatory English language and its difficulty in recognising other languages which have existed and been used in England for very many years. To some extent, we in Scotland, Ireland and Wales have always had some sense of identity, even those of staunch unionist tendencies, but in England it is clear that there is a very hazy idea of what England actually connotes. The England/Britain conflation is an example of this. Increasingly I have begun to realise that there are within England many groups whose identities have been gradually erased and replaced by a British myth, which does not express to a full extent who they feel they are. And they are deprived or restricted in how they can begin to articulate their identity to themselves and to let it evolve in the present. In a programme about ‘Sir Gawain and the Green Knight’, the poet, Simon Armitage spoke to former colleagues of his father’s in a village miners’ welfare and found that some of them were familiar with aspects of the language used in the epic poem. Having read your post, Mr Ramsey, I was prompted to reflect on what this ‘reawareness’ of their ‘real’ language’ might have on the many peoples of England. In similar vein, another member of a poetry writing group of which I am a member, has begun to dabble in writing poems in a language that phonetically represents the way in which her parents and uncles spoke, and still speak, in the part of London in which they were born, brought up, worked and lived. She has lived in Scotland for many years, writes outstandingly well in standard English, speaks with a south of England accent. Increasingly, a number of us have been using Scots routinely in our pieces and this set her to thinking whether she could begin to recreate thoughts in the language she heard as a child and which she still hears in family gatherings. Perhaps if more people in England could regain the confidence to write in what their ‘native’ language really is and, to begin to use it in interactions with official bodies, without embarrassment, then maybe there would be the beginnings of the ‘conscientization’ which Paulo Frieire spoke of developing amongst the dispossessed in the favelas of Brazil, then maybe more people in England would begin to realise that the British identity was not the only one and, perhaps, only a small part of their actual identity. During the debate prior to the 2014 referendum, while my sense of being Scottish was heightened (not in any exclusivist, wha’s-like-us-? way) I also recognised that part of my identity was British and that I was comfortable with that. I have always had the hope that if there were some kind of awareness of a humane, decent sense of Englishness (or of a range of ‘Englishnesses’) then maybe there would be growing realisation that the United Kingdom had reached the end and that we could disengage amicably from each other. “You may say, I’m a dreamer……”! Thanks Mike. So well said. As I posted on the Scots language keyboard replying to Moscow, I was born south of the border and was not taught any language other than English at school. As I studied computing and electronics I had no need of other languages than English for my career. I now realise, at the age of 72, that I am missing something, and if I had my life over again I would like to learn some other languages mainly for use when travelling abroad. Having lived in Scotland for 12 years I love to hear Scots and Gaelic spoken although I do not understand them. I also like to see road signs in dual languages and in some towns street names. In my local Co-Op store in Pitlochry they labelled all the shelves with both Gaelic and English product descriptions. This is very good for tourism and promotes Scotland to the world as a thriving country. As a professional mother tongue Welsh linguist, language activist, Celt and human being, I fully support the efforts to promote Scottish Gaelic, Scots and the other languages of Scotland that have suffered (and in some places still do so) from the imperialist, monoglot and monochrome ‘culture’ that has been imposed upon us by the English language and its education. Cultural linguicide no less. Whatever language you speak or can understand, it keeps changing decade by decade. I only need to have a conversation with my granddaughter (60 year gap!) to get evidence of that.